12 Pack - Tall Acrylic Base Wire Back Adjustable Display - White Wire Clear Base Sturdy acrylic base wire back stand, measures 4" wide, 5-1/2" tall, 5-1/2" deep. Machine-riveted to a heavy, vinyl coated, steel wire back brace. Ideal for displaying serving trays, plates, china, gift ware, artwork, tiles, framed photos, collectibles and plaques. 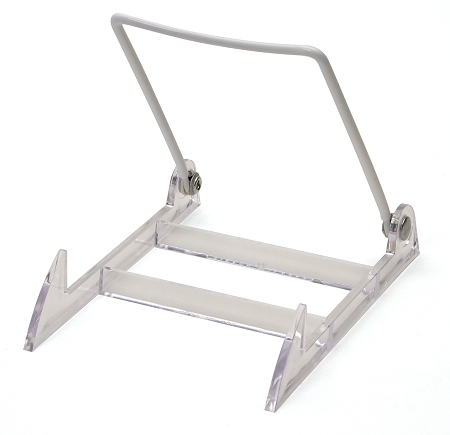 Can hold/display items measuring 9" - 18" and up to 4.5" deep.